If you missed out on the incredible ZenBook deal from Asus this past year then have I got good news for you! For a limited time and, naturally, while supplies last Microsoft’s online store is offering up the ZenBook UX305FA Ultrabook from Asus for $599 shipped! This is a $100 discount off of the original price, which is already a solid deal in and of itself, especially for a device that comes so highly rated. The UX305FA created quite the buzz earlier in the year by providing users with impressive specs at a price that was hundreds of dollars less than competitive models. For starters, this 13.3″ Ultrabook comes with 8GB of RAM, a 256GB solid-state drive (SSD), and a native screen resolution of 1,920 x 1,080 pixels. In addition to that, the 13.3″ full HD screen also comes in a matte finish, totally eliminating screen glare. Other features that you might be interested in include a fanless design, three USB 3.0 ports that has one that is capable of quickly charging devices like a smartphone or tablet, up to 10 hours of battery life, and an aluminium chassis that measures a little under half an inch thick. In fact, when you look at it from a side profile view you could easily mistake this device for the MacBook Air from Apple. Moreover, since this is a Signature Edition model, the UX305FA comes without the Asus shovelware that you would typically go through and uninstall. As far as operating systems go, this bad boy comes with the brand new Windows 10, meaning there is no need to update it out of the box. Not everything is all sunshine and rainbows with this laptop, however. The keyboard isn’t backlit and the built-in speakers aren’t the best. Though the interesting part about the audio is that if you plug in a pair of headphones you’ll be treated to an audio subsystem from Bang & Olufsen, which is pretty nice. Probably the strangest and most frustrating thing about this device is the fact that the power button is located directly next to the delete key, which could cause some serious problems if you are a speedy or sloppy typist. 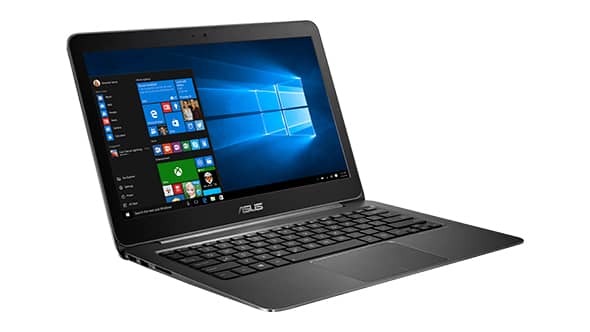 If you are looking for a pretty top-notch Ultrabook for a ridiculously good deal then the ZenBook UX305FA from Asus for $599 shipped off of Microsoft’s online store is one deal that you really can’t beat. Sure this device isn’t without its flaws, but, in this case, the pros definitely outweigh the cons. So, if you’re interested then you better scoop one up fast before the deal ends or the supplies run out! Thank you for this artical. I bought the Zen Book and its great.